Yesterday, I talked about the food and drinks available on our cruise ship, the Royal Caribbean Radiance of the Seas, during our recent Alaskan cruise. 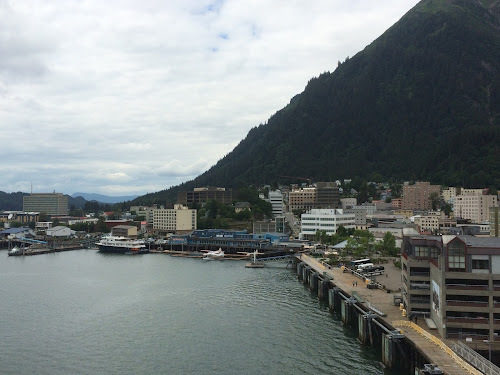 Today, I'm talking about the food we enjoyed at our four ports-of-call as well as Anchorage, Alaska, where we went when our cruise concluded. Although the food on the ship was fine, I enjoyed the food we ate in the ports a lot more. It wasn't fancy, but it was local, fresh and really quite delicious. Ketchikan, Alaska is a small coastal town of about 8,000 people known for its fishing. 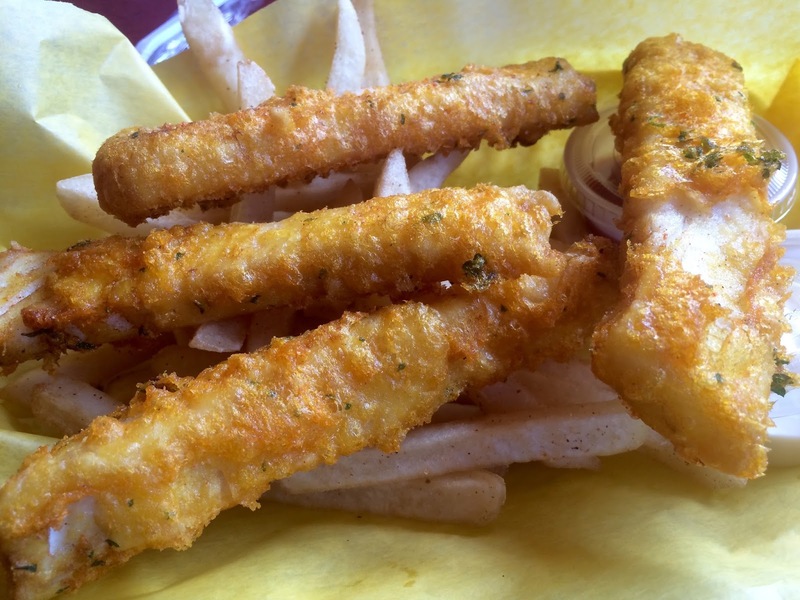 As such, getting good seafood was a priority, and my research pointed to Alava's Fish-n-Chowder as the best among the town's several restaurants offering fish and chips. Alava's isn't much to look at. This place defines a "hole in the wall," as it is quite literally a small porch with picnic tables and a window where you can order food. That said, I was afraid it was going to be overrun with people, since it's very close to where the cruise ships dock, so we went early. Luckily, it wasn't really that busy early. Dismiss this "shack" at your peril: Alava's fish & chips are out-of-sight good. The fried halibut fish and chips we had were fantastic, definitely the best fish and chips I've ever eaten and quite probably my favorite meal of the trip. The restaurant boasts that it doesn't open for breakfast because they are out catching your lunch, and I believe it. The fish was incredibly fresh and delicious, coated with a light crunchy breading and served with zippy tartar sauce and seasoned fries. The clam chowder was also very good, loaded with clams and served with a creamy broth that wasn't as thickened as most chowders. 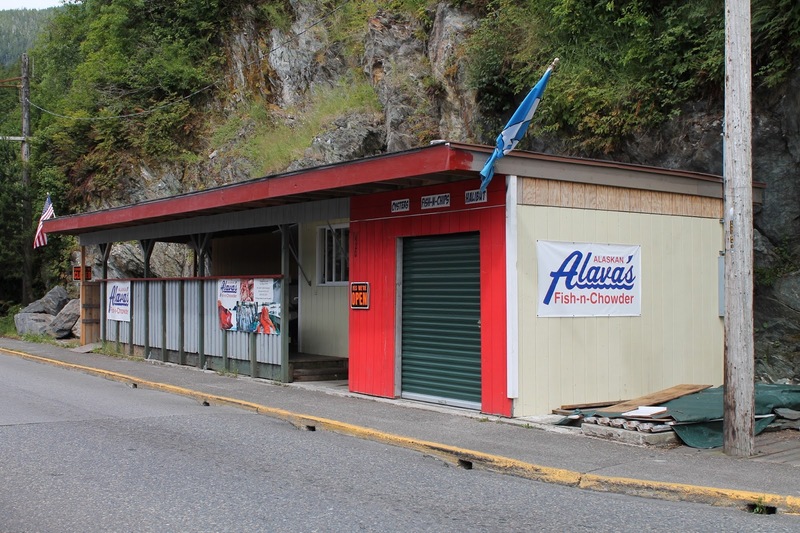 Food in general can be expensive in Alaska, but Alava's was affordable and the small crew of people that work there were very friendly. Just prior to going to Alava's we spoke to a merchant running a souvenir shop across the street and I asked her if Alava's was a good place. She told me it was the best, in fact, we saw her pick up her lunch while we eating there. Anyplace that's a favorite among locals is a good sign. As Alaskan cruise ports go, Icy Strait Point is probably the least significant. It isn't a real town (although it's a short walk from the little town of Hoonah), but rather a former fish cannery converted into a museum, restaurant and shopping center. Mostly, it exists as a cruise-ship destination, as there are a lot of "excursions" (i.e. planned outings) that you can do from here, including the world's longest zip-line. Still, it's worth visiting, as we enjoyed walking around the museum, shops and forest trail. A short walk along the beach from the main complex will bring you to the Landing Zone Bar & Grill, a rustic wooden structure with excellent views out onto the water. 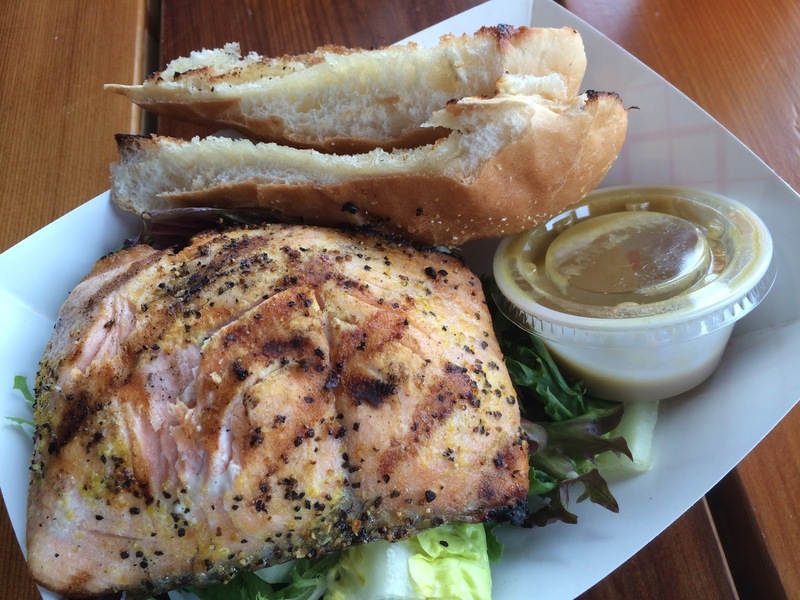 Grilled salmon from Landing Zone in Icy Strait Point. 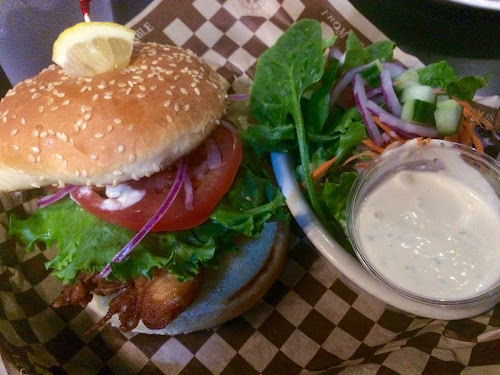 Given the facility's past as a fish cannery, we stuck to seafood, hoping for another good meal, and we weren't disappointed. The grilled salmon was super-good: fresh, cooked just right, lightly seasoned and just a little smoky from the grill. It arrived to our table with a small side salad and garlic bread (who doesn't love garlic bread?). At Landing Zone, we also got our first of several great tastes of Alaska's local beer. On tap are several selections from the Alaskan Brewing Co. in Juneau. The menu didn't specify whether the "pale ale" we ordered was Alaskan's American pale ale or its IPA, but it was pretty hoppy, so I assume it was the latter. It was also really good: bitter, a bit citrusy and balanced with a little malt. Just like I like my IPA. As worth visiting: the ice cream counter at Misty Bay Lodge in Hoonah. If you make the walk into town from Icy Strait Point, you deserve a treat, and the they have a small but satisfying selection of flavors available in bowls, cones or waffle cones. 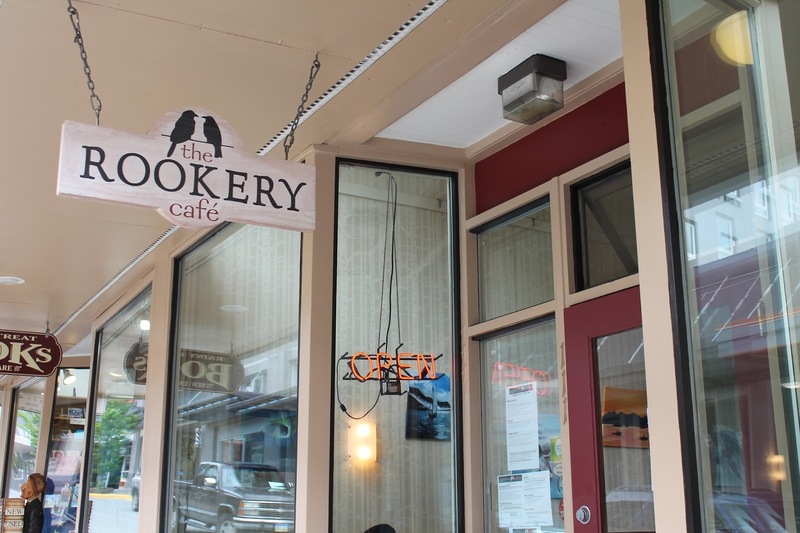 The Rookery Cafe is tucked away on a downtown Juneau side street but worth seeking out. Juneau was by far the largest of four ports we visited on the cruise. In a way this made it the most difficult to choose a lunch spot: there were many more choices than in the other towns. It seemed the most likely to also offer up "touristy" options, so I worked at finding something more off-the-beaten-path while still within walking distance of the ship. That's what brought us to The Rookery Cafe. It's hidden down a side street in downtown Juneau without a lot of shops and looks like the kind of place that locals would frequent. Service at lunch is minimal: you have to find your own table and place your order at a counter, but it has a nice atmosphere and the people were friendly. Dungeness crab salad, The Rookery Cafe in Juneau. The food was also tasty. 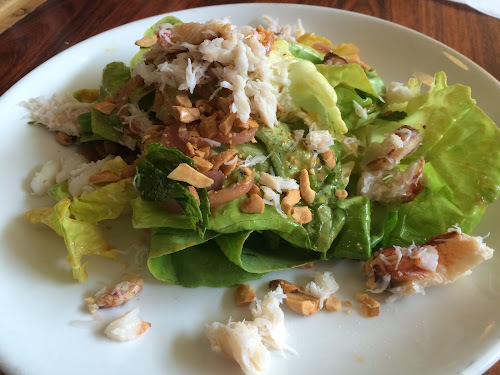 I chose the dungeness crab salad, an entree-size salad with butter lettuce, pickled shallots, peanuts, mint and a spicy curry dressing. Since I knew we would be getting plenty to eat on the ship for dinner, it was nice to have a lighter but satisfying lunch. The Asian flavors worked really well with the crab, which was generously portioned onto the top of the salad. Props to Rookery's chef Beau Schooler, a semifinalist this year for the James Beard Award for Rising Star Chef. Skagway is a sleepy little town that doesn't look like it would have much going on if it wasn't for the cruise tourist trade. But it has a fascinating history as an important town in Alaska's Klondike gold rush of 1897. 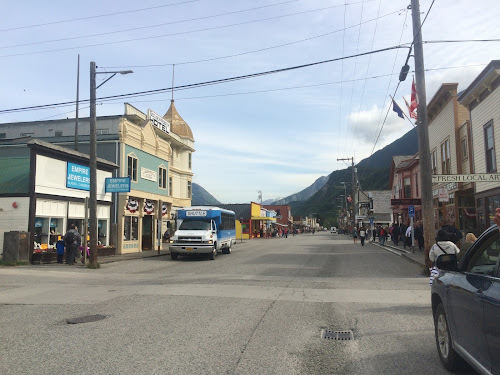 Much of Skagway's downtown has been preserved in late 19th Century style--all the better for luring passengers off their cruise ships and into the town's numerous souvenir stores. Walk down Broadway far enough and you'll find Skagway Brewing Co., which was actually established during the gold rush in 1897. Although no longer in its original location, the pub has a nice-sized bar and dining room, a fairly typical pub menu heavy on fresh local seafood and a selection of beers made on-site that are only sold in the pub. Fried halibut sandwich, Skagway Brewing Co.
For lunch, we enjoyed The Alaskan Sandwich, deep-fried halibut on a sesame seed bun with tartar sauce, tomato, onion and lettuce. Side salads aren't usually very notable--it's what you get when you feel like you've had too many fries--but theirs was memorable because the house-made dressing was some of the best blue cheese dressing I've ever had. It was tart and creamy with assertive but not overwhelming blue cheese flavor. We also tried the IPA, the Chilkoot Trail IPA, which was good, although a bit maltier than I like my IPA. Still, I'd definitely recommend trying it, since you won't find it anywhere else. 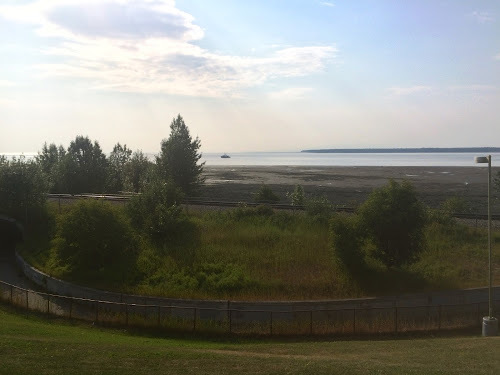 After finishing our cruise in Seward, Alaska, we hopped aboard the Alaska Railroad and took the train to Anchorage. With over 300,000 people, Anchorage is Alaska's largest city by far. In fact, I believe it's the most northern city with a population of over 100,000 people in North America. We asked several locals where we should have dinner, and Glacier Brewhouse was the answer we heard most. The handsome brewpub, accessed from a small indoor mall, features dramatic wooden vaulted ceilings and a central stone fireplace. The pleasant small of alder wood smoke permeates the dining room, enticing us to order something from the list of wood-grilled items. In addition to grilled items, the menu features pasta, sandwiches, seafood and brick-oven pizza. 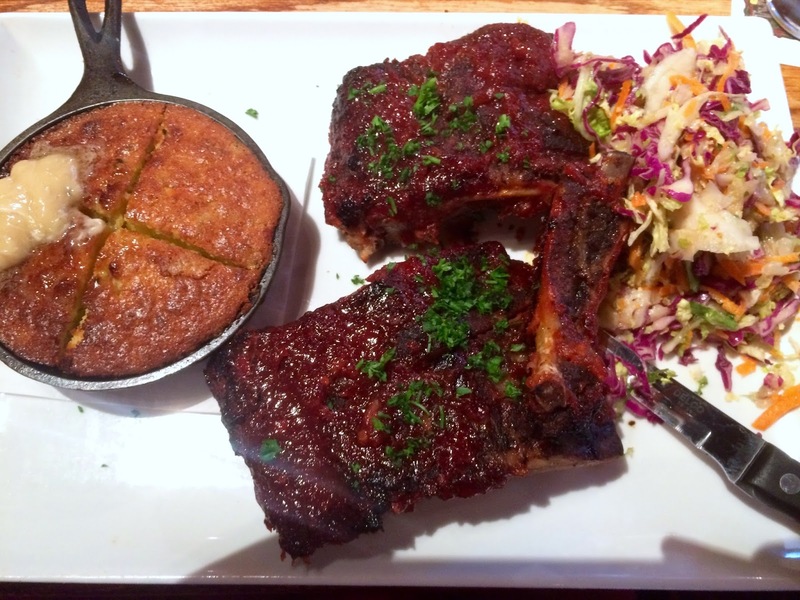 Glacier Brewhouse's barbecued baby back ribs and Brewhouse blue salad. I was tempted to get the Bering sea crab legs, which our server told us was very good but a small portion. With a hungry belly and that smoke in the air, I opted instead for the barbecued baby back ribs, a delicious platter of smoky, tender ribs glazed with the brewhouse's signature whiskey barbecue sauce and served with a mixed vegetable slaw and jalapeño cornbread with maple butter. What is it with Alaska and excellent blue cheese salads? 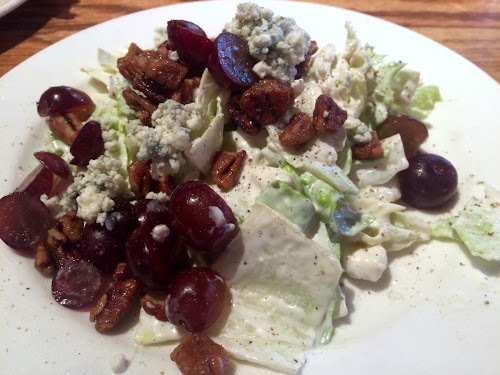 Glacier Brewhouse also handles the pungent cheese well, mixing dressing and crumbles together in a mixed greens salad with grapes and caramelized pecans. Of course, we sampled their on-tap IPA, another satisfying local brew with a bitter hoppy kick. The night we stopped in, they offered the standard IPA and a cask-conditioned alternative, which had a creamier texture and is also served a little warmer. Although interesting, I prefer the colder classic version. Wanting another drink after our dinner at Glacier Brewhouse, we wandered into Fat Ptarmigan, a wood-fired pizzeria that opened a couple years ago. The modern, minimalist space would make Fat Ptarmigans fit in in any large city. The pizzas coming out of the kitchen looked and smelled delicious. Had we more day--or larger stomachs--I would have liked to sample them. Instead, we sat at the bar an enjoyed yet another Alaskan IPA, this time the Pleasure Town IPA from Midnight Sun Brewing Company. in Anchorage. Now we have something to look forward to if we find ourselves in Anchorage again. Alava's Fish-n-Chowder, 420 Water Street, Ketchikan, Alaska (near the tunnel, across the from the cruise-ship docking area). (907) 617-5328. Landing Zone Bar & Grill, 108 Cannery Road, Hoonah, Alaska (on the western edge of Icy Strait Point near the zip-line finish area). (907) 945-3141. Misty Bay Lodge, 286 Front Street, Hoonah, Alaska (in the center of Hoonah). (907) 321-5859. The Rookery Cafe, 111 Seward Street, Juneau, Alaska. (907) 463-3013. Reservations: Yelp. Skagway Brewing Co., 7th & Broadway, Skagway, Alaska. (907) 983.2739. Glacier Brewhouse, 737 West 5th Avenue, Ste. 110 (between G and H Streets), Anchorage, Alaska. (907) 274-BREW. Reservations: Open Table. Fat Ptarmigan, 441 West 5th Avenue (at E Street), Anchorage, Alaska. (907) 777-7710 Reservations: Open Table. That Salmon, though?!? That's what I'm talking about. The salmon was really good! I enjoyed this a lot more than the salmon we had on the ship.